i do try to avoid photographing and talking about things here - though the fact that i'm an inveterate, indiscriminate hoarder is obvious and kind of unavoidable, you don't need to hear all about the dominos and plastic animals and moist towelettes and bits of icelandic licorice i carry around the city - but naurnie got me all worked up when she posted about her day-to-day jewelry. mine is very meaningful to me as well, you see, and it would be a great shame if, say, a crocodile ate one or both of my hands and you never saw it (i saw romancing the stone several dozen times in the eighties, so that was my primary concern when we bought my engagement ring, easily the fanciest thing i've ever owned: what if a crocodile makes off with my hand?). and so. the silver cuff ring at top is from a tibetan shop on union street in san francisco; i bought it to replace a similar ring from a kiosk in the garage in harvard square. the script is a six-syllable mantra associated with the bodhisattva of compassion. it's particularly handy as a hook for the rest of my daily pieces, all of which are removed and set aside on a regular basis (some people sleep in their engagement and wedding rings; i remove mine when i eat chips). the white gold band perpendicular to the cuff is my wedding ring, part of the late, amazing tobias wong's diamond project; it came in a little plastic bubble from a grocery-store toy machine. i also have one of tobi's diamond-embedded dimes, but i can only wear it once every week or so; i'm allergic to the nickel-copper blend (if we are ever in a superhero battle royale, you can defeat me with costume jewelry). 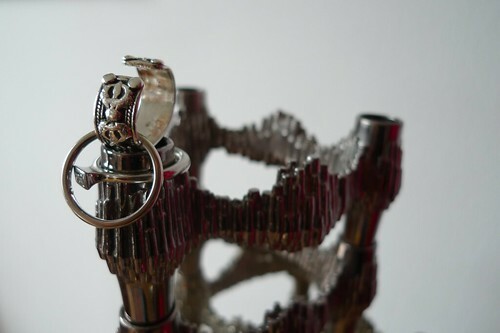 the platinum solitaire framed in the tobi wong ring is my engagement ring, by henrich & denzel (compliant with UN resolutions 1171, 1173, 1306, and 1343). the modern bezel setting suits me and my interest in playing with cats without putting their eyes out, and the jeweler is really understanding when joe and i come back in to have our rings polished up after feats of strength or especially nasty manual labor. I am so glad that you did this. I love knowing what jewelry people I adore wear and why they choose to wear it daily. These are lovely, my friend. So lovely. What a beautiful photograph. The jewelry seems very right for you. Love the pieces and the background. I would join you ladies, but the only things I wear daily are my engagement and wedding rings. I never really got used to jewelry. i think the cuff ring snuck into the every-single-day mix with my wedding/engagement rings (years prior to them, actually) because it's so unobtrusive - it's flat and adjustable, so i don't have to think about it too hard. i also wear something from joe's and my collective pile of watches every day (my wrist feels funny without that weight; i wore a watch at our wedding, too), but otherwise i tend to squirm in jewelry as well; it gets in the way. i'm trying to get in that habit of removing my engagement ring when i shower. just had the little puppy cleaned and it looked so shockingly shiny and new afterward that i resolved to take better care of it. the downside, of course, is that i sometimes forget to put it back on after the shower. this has resulted in loud public exclamations of woe and despair already twice this week. both times it took me an embarrassingly long half second to remember where o' where it'd gone to. i ran into joe coming back up to our apartment one morning because he'd forgotten to put his wedding ring on before leaving for work. i was touched that he was retrieving it (do most people go back for it? what's the threshold of difficulty? ).